The older I get, the more I hear these D-words. Downsize and declutter are what you need to do when clearing out rooms after kids leave home. Or in packing up an entire house before moving to smaller retirement quarters. New industries have emerged to assist those who aim to downsize and declutter. There are masses of How To books and websites that give practical advice. People and companies are ready, for a fee, to help you decide what to throw away and how best to do it. Yet another industry can help you store all the stuff that you still want to keep (out of sight) after your home has undergone the D ‘n D treatment. My New Old Self is no professional Downsizer or Declutterer, but I can offer some thoughts on doing these deeds. If you’re thinking of selling your stuff, think again. Lack of demand for used furniture, crockery and art has driven down prices. An indication of this is seen in the British TV series, Antiques Roadshow. Remember that fave show of Frasier, his brother and dad in that fave sitcom of Baby Boomers? These days the show has to update its reruns with the current, lower estimated worth of many antiques. 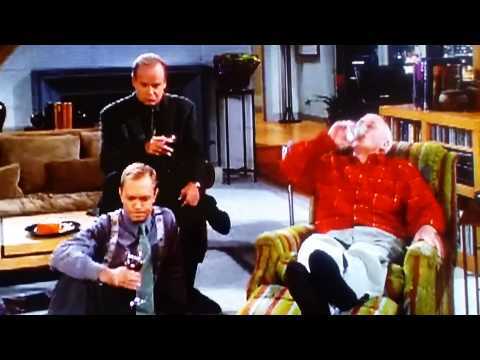 Frasier, Niles and Dad play their drinking game while watching “Antiques Roadshow” (knocking one back every time the word “veneer” is uttered). Another factor has caused second-hand stores to drop the prices they offer for the stuff you aim to get rid of. For the first time in human history, two generations are doing D ‘n D at the same time. 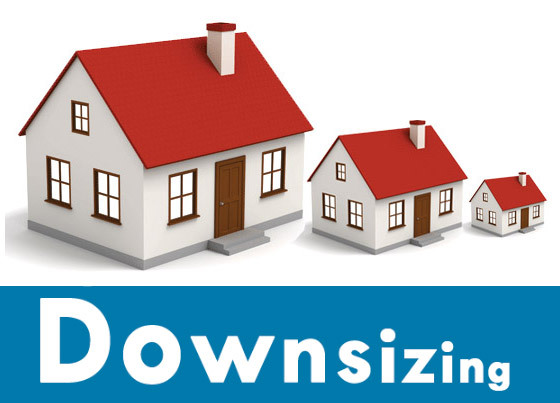 It’s called Double Downsizing. No longer is it only the elderly who are getting rid of stuff. Their middle-aged children often start to downsize when their own kids leave home. That’s two generations worth of stuff crowding the thrift shops. With no one clamouring for our stuff, we may be find that the only way of getting rid of it is to pay someone to take it away. You can call it charity – they do say it begins at home. If you’re lucky, someone may come and fetch your stuff as part of the donation deal. If not, there may be an additional fee for removing it. This next tip seems like a way to postpone decision-making. 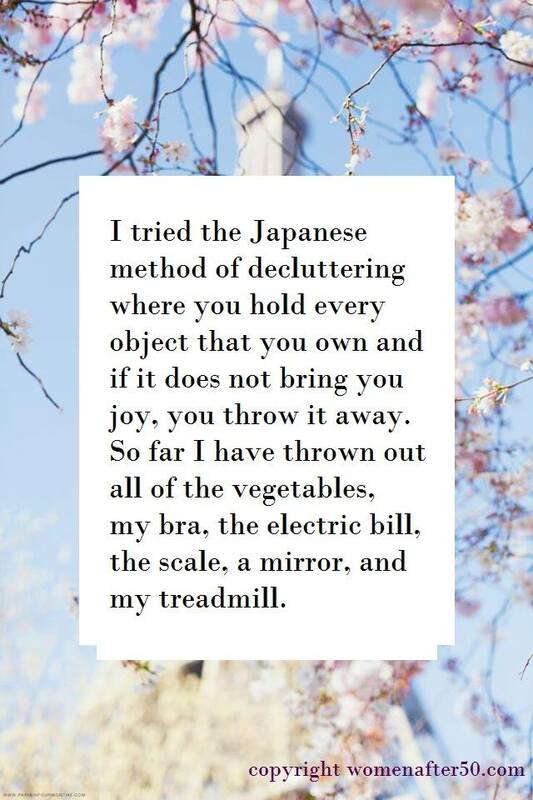 The suggestion is that you take photos of your stuff before it is dumped through downsizing and decluttering. Sure, some pictures on your phone would take up less space than the actual stuff. But then what? Most people don’t find time to look through the old photos of their family and friends, so I can’t imagine there will be a lot of time spent reviewing photos of old stuff. There’s a bullet to be bitten here. There is a lot of advice out there about dealing with the psychological side of D ‘n D. Much of which may seem silly, like doing some kind of ritual to say goodbye to your stuff. Or imagining the moment when your stuff meets up with its new owners. Bestselling books describe the decluttering experience as magic, an art and even life-changing. It may instead feel both emotional and onerous. It seems like one of the most important aspects of the Downsize and Declutter experience is to ensure that you devote enough time to it. Don’t begin right before your move, rather start well in advance. There’s a lot said about Being In The Moment. What better moment to be in than when you allow yourself to reminisce about the people, places and times that old stuff reminds you of. Once you’ve decided what to get rid of, you may be well advised to move it out as soon as possible. Did you get that? Chuck it ASAP! corners and drag it all out the door. These days I seem to have so many bags of stuff. Those waiting for me to go through them..those waiting to go to my favourite charity…and those for the tip. And still there’s too much ‘stuff’ in the house. How did one become so cluttered? Can’t imagine taking photos of it all!